Liverpool career stats for James Jackson - LFChistory - Stats galore for Liverpool FC! Jackson, who was "all grit and determination," joined Aberdeen in June 1923 for a club record fee of £2,000 from Motherwell. After plying his trade in the homeland of his parents, the Newcastle-born right-back signed controversially for Liverpool in May 1925. Aberdeen's original asking price was £4,500 which Liverpool were not ready to pay. Jackson had been officially signed for Dons' next season, but requested to be sold to Liverpool, which Aberdeen finally agreed to for "only" £1,750. Jackson established himself at Liverpool towards the end of the decade and only missed four out of 126 first division games from August 1927 until May 1930 while captaining the side. He tore a knee ligament in the club's tour of Scotland at the end of 1929/30 and missed the last game of the season as well the first two months of the following campaign after ill-advisedly playing in the first game. His father, James, was Arsenal's captain in the club's first division inaugural season so James jr. was always popular among the Gunners' fans and said to have received "the biggest ovation any visiting player ever gained at Highbury." Appropriately Jackson wore the captain's armband for Liverpool for the first time on 27 October 1928 at Arsenal. James Jr. started his divinity studies at Aberdeen University and finished them at Cambridge while still an active player for Liverpool so he missed almost three months during the 1932/33 season, for instance. One dumbfounded football writer asked after a game: 'Is Jackson really going to be a minister? If so, if he prays as hard as he plays he ought to be Archbishop of Canterbury in record time!' When Jackson left the club he was ordained as a minister in the Presbyterian Church and inducted into the charge of St. Andrew’s Church, Douglas, Isle of Man on 29 June 1933. In May 1946 he was appointed president of the Liverpool Free Church council. The Everton legend, Dixie Dean was Reds' chief tormentor in the 20's and 30's. Elisha Scott was Liverpool's custodian when Dixie was running amok and one of the greatest goalkeepers in Liverpool's history. Elisha Scott is without a doubt one of the greatest goalkeepers in Liverpool's history. His career spanned an astonishing 22 years from his arrival in September 1912 until he left in June 1934. 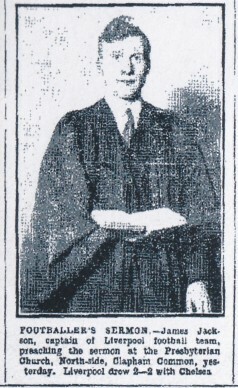 From the Nottingham Evening Post on 14 November 1930.